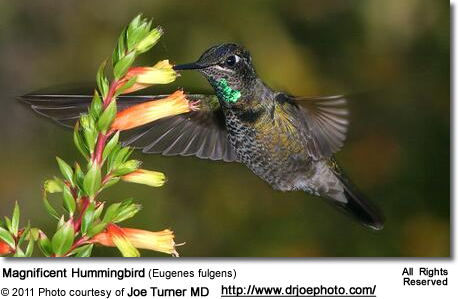 The Magnificent or Refulgent Hummingbirds (Eugenes fulgens) were named for their spectacular iridescent plumage. Until the mid-1980s, they were referred to as Rivoli's Hummingbirds. 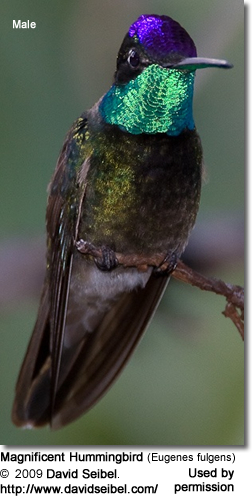 They are the second largest hummingbirds north of Mexico. Only the Blue-throated Hummingbirds are larger. They occur in mountains from the southwestern United States to western Panama. These birds are known to be very friendly, often remaining close to humans within their feeding habitat. Spanish: Colibrí Gorrivioláceo, Colibri Magnífico, Colibrí Magnifico, Colibrí Magnífico ... Italian: Colibrì magn, Colibrì magnificente ... French: Colibri à poitrine noire, Colibri de Rivoli, Colibri magnifique ... Czech: Kolibrík skvostný, kolib?ík skvostný ... Danish: Purpurisset Kolibri ... German: Dickschnabelkolibri, Dickschnabel-Kolibri, Violettkron-Brilliantkolibri ... Finnish: Huppukolibri ... Dutch: Rivolikolibrie, Rivoli-kolibrie, Rivoli's Kolibrie ... Norwegian: Purpurissekolibri ... Polish: ametyscik, amety?cik, Amety?cik cienkodzioby ... Slovak: medovec tmavobruchý ... Swedish: Rivolikolibri ... Russian: ???????-??????.. Japanese: aonodohachidori, ???????? ... Chinese: ??? Found in southwestern USA (mostly southeastern Arizona; to a lesser degree southwestern New Mexico, Colorado, southwestern Texas and Arkansas). Some occur as far west as California and as far east as Alabama and Florida. They range south through most of Mexico to Guatemala, El Salvador, Honduras and northeastern Nicaragua. Eugenes fulgens spectabilis (Lawrence, 1867) - sometimes separated from the larger nominate race as Rivoli’s Hummingbird, E. spectabilis. Found in the highlands of Costa Rica and western Panama. In the United States, the Magnificent Hummingbirds are found in highest concentrations in southeastern Arizona and southwestern New Mexico. They are only rare vagrants elsewhere in the United States. Specifically they have been observed in the following U.S. states: Alabama, Arizona, Arkansas, California, Colorado, Georgia, Kansas, Minnesota, Nevada, New Mexico, Texas, Utah and Wyoming. They breed in mountainous areas in the southwestern United States and winter in Mexico through to western Panama. They are common residents in the higher elevation mountains of Costa Rica. Their habitat includes humid montane oak forest from about 2000 m (~ 6 560 feet) to the timberline. They are typically found along the edge and in clearings, but also occur on pastures, open woodland, and scrubby areas. Size: Its length ranges from 4.3–5.5 inches (11–14 cm), with an average weight of 0.2–0.3 oz (7–8 g). Their wingspan is about 7.1 inches (18 cm). Common Physical Traits: The upper plumage is blackish-green. Both sexes look very dark unless the sun catches the iridescence of the plumage. They have a distinctive white spot behind each eye. The black bill is long, thin and slightly curved. 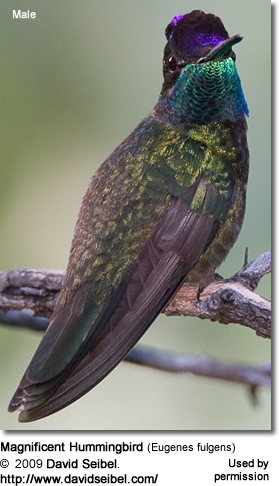 The male can easily be identified by his iridescent bright blue-green gorget (throat patch). His upper plumage is glossy bronze-green above, turning more bronzed towards his tail. He has a green-bronze chest, greyish abdomen and undertail feathers. His head is black, except for the violet crown (top of head) and white stripes behind the eyes. His black tail is forked. The male's iridescent crown and throat patch are only visible at certain angles and in bright light; in poor light, he may appear to have a drab, blackish head. The female's upper plumage is bronze-green and her under parts a dull grey. She has a grey throat with faint streaking. Her dark rounded tail has greyish-white tips. Like the male, she has white stripes behind the eyes. Juveniles look like females, except their plumage is duller and more brown. Similar species: The female resembles the female Blue-throated Hummingbird; except she lacks the large white tail tips and white cheek streak. 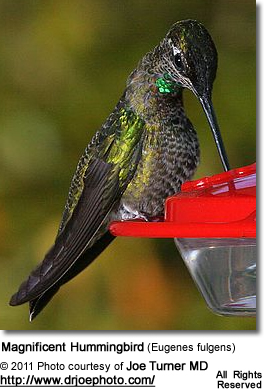 She can be differentiated from other hummingbird species by her larger size. The female is responsible for building the cup-shaped nest out of plant fibers woven together and green moss on the outside for camouflage in a protected location in a shrub, bush or tree about 3m above ground often near the tip of a descending bamboo stem. She lines the nest with soft plant fibers, animal hair and feather down, and strengthens the structure with spider webbing and other sticky material, giving it an elastic quality to allow it to stretch to double its size as the chicks grow and need more room. The nest is typically found on a low, thin horizontal branch. The average clutch consists of two to three white eggs, which she incubates alone for about 15 - 19 days, while the male defends his territory and the flowers he feeds on. The young are born blind, immobile and without any down. They primarily feed on nectar taken from a variety of brightly colored, scented small flowers of trees, herbs, shrubs and epiphytes. They favor flowers with the highest sugar content (often red-colored and tubular-shaped) and seek out, and aggressively protect, those areas containing flowers with high energy nectar. They use their long, extendible, straw-like tongues to retrieve the nectar while hovering with their tails cocked upward as they are licking at the nectar up to 13 times per second. Sometimes they may be seen hanging on the flower while feeding. In winter, when flowering plants may not be readily available, they may drink the sap from holes created by sapsuckers, as a substitute for nectar. They may also visit local garden nectar feeders for some sugar water, or drink out of bird baths or water fountains where they will either hover and sip water as it runs over the edge; or they will perch on the edge and drink - like all the other birds; however, they only remain still for a short moment. Its call is described as drrrk with a harsh grating quality.